The "topic" of decorating an indoor succulent garden is something I have not addressed here on TLLG's Blogger, tumblr, or Facebook in quite some time; but even though it is the season when my outdoor (urban) garden calls for "overtime" attention, I have not neglected my wonderful indoor succulent garden, a garden of unusual succulents that, depending on the time of year, is "visited" by unique figurines. This is a fact you may recall from seeing my indoor succulent garden — here in cyber-space — when it has had very different "visitors" for Easter, Halloween, Thanksgiving, Christmas, Winter, Spring, Summer and Fall as well as for "off season" celebrations such as Penguin Awareness Day. And, once in a while, as you may recall, dear reader, figurines of fruits such as apples 'n oranges, as well as pears (that all visit my succulent garden), "weighed in" on their life experience in my succulent garden. So today, on a stormy Monday morning, when it is impossible to be tending the garden I have on my terrace, I have been given the opportunity to share the 2012 summer look in my indoor succulent garden, as evidenced by a bathing beauty figurine who is new to my succulent garden. I was given this figurine (over the weekend) by a dear friend whose husband also has an indoor succulent garden, as I described in an entry here on TLLG, which you may refer to by clicking here. 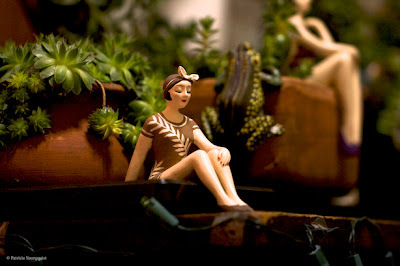 In any event, the bathing beauty figurine was welcomed by my succulents and by a little frog — who jumped on a succulent container — to get a closer look at her (as you can see in the image posted at the top of today's entry)! The "story" of the importance of indoor gardens will be included in the series of Virtual Stories (mini movies) which I will be producing for a campaign that I launched late last week on indiegogo, a campaign whose mission is to give voice to the garden, and in doing so remind folks that "The very old, they are miracles like the just born; close to the end is precious like close to the beginning." This post is one of the many reasons that I have nominated you for the Illuminating Blogger Award. 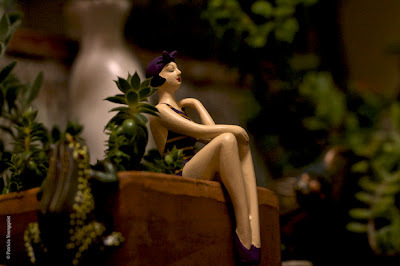 Details on the award can be found at http://foodstoriesblog.com/illuminating-blogger-award/. I find myself returning to your blog over and over again for inspiration and illumination. I'm vey flattered by your nomination, Kevin, but I am a little overwhelmed right now, and unable to fulfill the tasks required for this award. Please know, that the things that I grow and in my garden, and I, truly appreciate your nod! All of us admire your garden in cyberspace as well as your photo-ops and great writing.